Super Bowl 2019 live stream | Patriots win the Vince Lombardi trophy! Can the Patriots see out Super Bowl LIII? Update: Tom Brady and the New England Patriots won their record breaking 6th Super Bowl 13-3 against the LA Rams. If you want to know more about how to watch your favorite TV and live stream sport then click the link to see our dedicated guide. Surely it's going to be Tom Brady's sixth Super Bowl ring now? Or can Jared Goff and the LA Rams stop the New England Patriots? Whatever happens, you can get a Super Bowl live stream by following the advice in this article. It's really easy to get a Super Bowl 2019 live stream - no matter where in the world you are. And with our help, you can even watch without having to sit through the commercials. The Los Angeles franchise had the better regular season with an impressive 13-3-0 record (matched only by the New Orleans Saints that they vanquished in the conference finals). Sean McVay - who became the youngest head coach in NFL history when he took the job in 2017 - continues to confound his critics and is hoping to make history once again. But Tom Brady's New England Patriots have the big game experience, making this their third consecutive Super Bowl visit. Not to mention the fact that their line is lead by possibly the finest quarterback to play the sport. They have the chance to tie the Pittsburgh Steelers as the most successful team in NFL history at Super Bowl LIII. 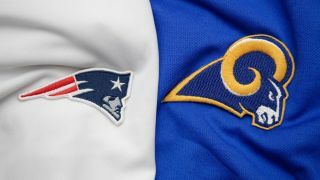 Whether you live in the US, the UK or anywhere else in the world, we’ll show you exactly how to watch the Patriots vs Rams in today's so that you don’t miss a minute of the action. It will be broadcast by CBS in the US, but there are plenty of ways to catch it locally and internationally - and we can even tell you where you can get a Super Bowl live stream without having to put up with all those annoying ad breaks. If you don't have easy access to watch today's Super Bowl live online in your country - or you're away from your home country this weekend - the best way to watch it for free is to download and install a VPN. We've tested all of the major VPN services (more than 100 in total) and we rate ExpressVPN as the absolute best. It's compatible with a whole host of devices (including Amazon Fire TV Stick, Apple TV, Xbox and PlayStation, etc) and ranks amongst the fastest options out there. What's more, there's a great deal running offering a 49% discount, a 30-day money back guarantee and 3 months free with an annual plan - especially for TechRadar readers! So if you were already interested in VPNs now is a great time to sign up. Simply open the VPN app, hit 'choose location' and select a UK location - it doesn't matter which one and it's super easy to do. The reason to choose the UK? Because it's being broadcast live for free, so as soon as you have a UK IP address you're free to watch the Super Bowl hassle free. TVPlayer is a free legal online streaming service, which offers hundreds of channels. Among the channels you'll find on offer at TVPlayer.com on offer is BBC One which will show the entire event live. And the best bit? The BBC doesn't have commercials so you'll be able to enjoy a totally uninterrupted Super Bowl live stream without a single commercial break. Want to record the Super Bowl and watch it later? TVPlayer will also allow you to do that too. You'll need to sign up for a paid account, but the good news there is that the site offers a 14-day free trial so no payments required! What other VPNs to we rate? Which countries can I watch the Super Bowl from using a VPN? A VPN will enable you to watch the Super Bowl from literally anywhere. So that obviously includes: US, UK, Canada, Mexico, South Korea, Israel, Belgium, Germany, Spain, Australia, Denmark, India, Netherlands, Brazil, Belgium, Romania, France, Sweden, Italy, Portugal, Czech Republic, Ireland, Poland, Kenya, Hungary, South Africa, Indonesia, China, Nigeria, Bangladesh, Russia, Japan, Egypt and more! If you live in the US and have access to the internet, then you’ll be able to watch the entirety of Super Bowl 2019 on CBS. In addition to broadcasting the game on cable TV, the network will stream the event live through its Sports website and mobile apps. CBS has even the sweetened the deal by allowing users to stream the Super Bowl without having to sign in. Prefer to watch football on the big screen via your favorite streaming platforms? Well you can do that too to as CBS will be streaming Super Bowl 2019 on Chromecast, Fire TV, Roku, Samsung Smart TVs, Xbox One, Apple TV, Android TV and more. But if you want to watch without any commercials - check out the options above! Note that you will need a US IP address in order to access all of the above or otherwise you won't be able to access the content from abroad - if you want to do so, you'll have to follow our VPN guidelines above and log in with a VPN, choosing a US server location. Hulu with Live TV $40 per month - Hulu with Live TV includes CBS, Fox, NBC and ESPN. YouTubeTV $40 per month - YouTubeTV gives you access to CBS, Fox, NBC and ESPN. DirecTV Now $50 per month - DirecTV Now includes CBS, Fox, NBC, ESPN and for $5 extra you can add the NFL Network. FuboTV $35 for the first month - FuboTV gives you the first month at a discounted rate but after that the price increases to $45 a month. The service includes CBS, Fox, NBC and the NFL Network but does not come with ESPN. American football fans (now we're talking your language, Brits) in the UK will be able to watch Super Bowl 2019 on either the BBC One for free (assuming you have a TV licence) or on Sky Sports with a subscription if you prefer the American coverage of the game. The event will be televised on BBC One starting at 10.45pm GMT and if that’s a little too late for you, don’t worry as replays will be shown the following day. If you prefer to live stream the NFL online, you can do that too via BBC’s iPlayer on both desktop and mobile. You may be asked to register for free in order to watch it but once you go through the simple and straightforward process, you’ll be able to enjoy it almost anywhere including on your smartphone, tablet, web browser, streaming devices, game consoles, etc. And it's worth repeating...if your outside the UK and still want to watch your home coverage, then take a look above at how to do so without difficulty by downloading and installing a VPN. CTV/TSN is the official Canada broadcaster for the Super Bowl and the CTV Go app will let you watch...well, on the go. Not got cable? Well don't get disheartened. We understand that you should be able to tune in to that CBS coverage from south of the border. Or if you happen to have a DAZN subscription then you can watch there as well - DAZN offers a 30-day money back option meaning that you can always sign up for the service and then get your money back within a month of signing up if you're not keen. Free-to-air network Channel 7 is showing the Super Bowl to NFL fans Down Under with kick-off at around 10.30am on Monday morning - we hope you've already put in your holiday request! For NFL nuts who already have a Game Pass, you can watch on there as well. While ESPN is another alternative. If you're outside the country and want to tune in, then you can use one of our favorite VPNs above to watch the free coverage from Oz or another nation. Super Bowl 53 is available live in seven languages and 170 countries and territories around the world - there’s a useful guide on the main broadcasters on NFL’s website. But to save you the time, we can tell you a few options in some of the most popular territories for watching NFL: Mexico - ESPN, Fox, TV Azteca; Brazil - ESPN; South Korea - MBC Sports; Germany - ProSieben, DAZN; France - TF1, BeIN Sport; Argentina - ESPN, Fox; China - Fox Sports, BesTV. As of the time of writing, the cheapest ticket for Super Bowl LIII starts at a whopping $3,600 per person in the 300 level at the very back of the stadium. If you want to get closer to the action, it’s going to cost even more with seats in the 100 level going for $15,075 each. These seats do include access to the three hour all-inclusive Premier Party at the Georgia World Congress Center, appearances and meet and greet opportunities with NFL stars and Hall of Famers, pre-game hospitality and a post-game confetti-filled celebration. Each year the Super Bowl takes place on the first Sunday in February. This year that means the Super Bowl will take place on Sunday, February 3. What is Super Bowl 2019 start time? While the kickoff time has yet to have been announced for Super Bowl LIII, last year’s game began at 6:30pm ET (3:30pm PT, 11:30pm GMT) so expect things to start around the same time this year. What's happening during the half time show? It was a drawn out, controversial process, but it has finally been confirmed that Maroon 5 will be headlining the event. Travis Scott and Big Boi (yep, the one from hip-hop legends Outkast) have been added to the bill as guest stars as well. Want to know more (including our list of the top 5 ever performances)? Then take a look at our dedicated guide on how to watch the Super Bowl halftime show. Where is Super Bowl LIII? Super Bowl LIII will take place at the Mercedes-Benz Stadium in Atlanta. This will be the first time the stadium, which opened in 2017, will host the world's biggest sporting event. However, this will be the third Super Bowl played in Atlanta with Super Bowl XXVIII and Super Bowl XXXIV both being held at the now-demolished Georgia Dome. The Mercedes-Benz Stadium can hold 71,000 fans and is located right in the heart of downtown Atlanta.